Genetics: Unknown - I have produced hypos from it?? Ok........I haven't a clue as to what anerythristic means in ball pythons????? This is the one and only male "Anery" from NERD....I purchased some hets from this male in 1999, and asked for the "first refusal" if the original daddy ever was offered for sale. Well, it was offered to me shortly after I received the hets. So I bought him.......as you can see he is stunning.......there is hardly any brown on this snake at all. As a baby import he was pure black and white with some gray mixed in. As he matured his white has become mixed with gray and black. 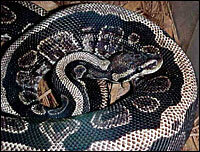 I know of a few ball pythons that have been born black and white, and through time the white turned yellow or brown. This animal is an adult and shows no signs of yellow,brown or the big question????RED!!! I'm hoping to reproduce this mutation soon. If this proves out........then we will have a major ingredient to the "Snow" ball python project to work with. Anerythristic x Albino equals double het for "Snow".......if this is even anerythristic??? That is the name that was given to it at the time of acquisition by NERD and I will keep it that way for now...........So the plan is to prove this one out and then breed it to albino females to get double hets for "Snow". Against a normal colored ball python you can see just how "odd" he really is. Imagine this snake as an albino!!!!!!!!!!! !............in some of the pictures below he is breeding a normal female for the Y2K season!! I was able to produce many hets from this "anery" male the first season I got him. Anery x Albino..................black turns white............white stays white..............a two toned white snake with pink eyes.......that's what I'm talking about!!! In the 2001 and 2002 breeding season I bred the Anery male to 2 of his daughters that NERD produced and sold to me.........I was hoping that line breeding him back to his "het" daughters would produce some anerys............well..........I produced some type of "Orange Ghost" from both daugthers over the two years of breeding them to their father ??????? ?...........The baby ghost pics are in the bottom row below............are they het for Anery?? ?...........did I miss?